Today’s independent pharmacies face tough challenges – surging demand, elusive profit margins, increased competition from new sources, and all with fewer pharmacists. 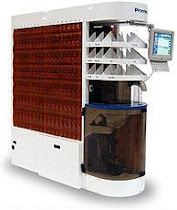 At Abacus Rx™, we understand the difficulties faced by pharmacies every day. That’s why we developed and designed a system specifically tailored to meet the needs of the Independent Pharmacy. Visual Pharmacy Plus ™ has an easy-to-use, graphical user interface with our proprietary “Single Screen Rx-Interface”. Our system makes the processing of prescriptions and filling refills quick and easy, all task are just a mouse click away. From processing prescriptions, to obtaining insurance eligibility, to managing inventory and updating the data base, you will be working with a system that is 100% HIPPA compliant, yet easy to use and train your staff. Our system simplifies the day-to-day tasks of processing prescriptions, leaving you with more time to do what you do best “Service Your Patients”. Visual Pharmacy Plus™ management system comes with a step-by-step training video, online technical support, training online or at our training facility, a live help desk with experienced customer service representatives and a proven history of more than 20 years of serving 1,000’s of users nation-wide.